The goal of the series is to provide early educators with the support they need to create high-quality learning environments for the children they teach. The central theme of the series: Revisit assumptions. To this end, the briefs look at current polices and practices; outline common pitfalls; and present strategies for effective implementation of high-quality learning experiences. The series — which will include a total of ten briefs — is being produced by Harvard’s Language Diversity and Literacy Development Research Group, headed by Nonie Lesaux, a Harvard education professor. This brief introduces both the challenges and the opportunities that currently exist in the complex landscape of early childhood education. A well-trained educator who could “create and experience this R2 learning environment” would be more likely to consult with her peers, feel more competent at her work, and remain in the profession. Courtesy of The Language Diversity and Literacy Development Research Group, Harvard Graduate School of Education. Citing the great strides that have been made in preschool quality, this brief explains how efforts to implement reforms can also have unintended consequences that hinder the creation of R2 Learning Environments. 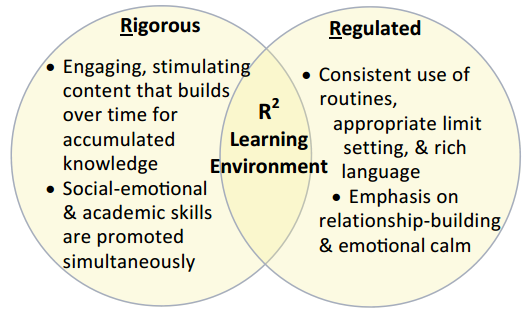 For example, assessing preschool children can be a valuable practice: assessment data can “anchor improvement plans… to the population’s learning needs.” But if assessments become little more than “compliance driven exercises,” than this “reform” ends up being a barrier to creating an R2 Learning Environment. Instead of guiding instruction, assessments end up burdening teachers and provide little insight about how to tailor instruction to meet children’s needs.. Similarly, workforce development efforts have the potential to help educators grow and improve — but not if the focus is solely on completing a certain number of professional development hours — instead of on building educators’ skills and use of instructional strategies. The brief also points to challenges in two other current areas of reform: maintaining staff-to-child ratios and following health and safety procedures. Solutions to these and other issues will appear in upcoming briefs. This brief also provides a short example of a preschool activity that references each of the four competency areas that the teacher uses. Delivering on the promise of high-quality early education requires a new commitment and strategic action. By empowering early educators to lead by taking these actions — and creating R2 environments — policymakers could vastly improve the early education of young children.